Mrs Helicopter Writes: How Clean is YOUR House? I often wonder how clean other people’s houses REALLY are. You see, I am an awful mix of complete neat freak and terminally lazy. I think people who often have WAY too much going on in their heads often have neat-freak tendencies. If I can “just sort this room out” then my brain will be all calm and my thoughts will be in order. Perhaps it’s a sign of an anxious person. “I got all these things to think through AND a stinky, messy pit to clean up…GAAAAAAAAAAAAAH!” Actually. That does sound like me. And I like my house to be clean. REALLY clean and tidy at ALL times. But it isn’t. And it never has been. Even before I had kids. Even when I only had one cat or even when I lived abroad and had NO cats. It was never, ever shiny spick and span. Because as with everything in life, my expectations do not meet reality. So then I wonder how clean other people’s houses are. Because I am secretly weirdly competitive about stupid things like this. Now, I am not talking about the super messy, life’s-too-short brigade where stuff is everywhere and no fucks are given. And just for the record, I have NO ill judgement of that either. I don’t care if you live in a pit. And I do envy your no fucks given attitude too. Because if I had that attitude, I’d either have been chasing the dragon, or have had my brain entirely re-wired. My MO is worry about everything at all times and that includes the state of my house. It’s not necessarily the best MO. I am talking about the ones whose houses are relatively clean looking and tidy, as much as they ever can be with small kids involved. So usually one room, at least during waking hours, will resemble a jumble sale but that’s NORMAL. But how often do they really clean their kitchen floor, change their sheets, wash the towels, dust the shelves, hoover, scrub the bath? Do I do it enough? Sorry, I mean do WE do it enough? Is it weird to ask? Would you tell the truth? Is it normal to care? Is it a feminist issue?! OK that last question is a bit of a red herring. The reason I got to thinking about this is two-fold. Firstly, I do have a cleaner who used to come fortnightly and now comes once a month. And the 5 minutes after she has left are the cleanest my house will ever be and it’s BLISS! But she’s MIA at the moment and I’m having a moral (if not, an excruciatingly middle class) dilemma: do I look for a temporary replacement or do I section off a big chunk of our weekend to get it done? And I am spoilt enough to REALLY not want to do this! I spend most nights bashing away on social media / writing / filming / editing / promoting and 4 days a week in work and the rest of the time parenting. I don’t want to clean. But I want a clean house! WHAAAAAAAAAAT! 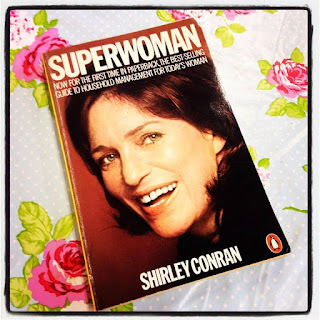 Secondly, and this is apt, whilst we were all out ignoring house work last weekend, I stumbled upon the fantastic and seemingly anachronistic 70s book “Superwoman” by Shirley Conran. Its preface stating “Life’s too Short to Stuff a Mushroom”. I had actually picked it up to scoff at its outdatedness…. Who gives a monkeys about being a domestic goddess these days?! Pah! GET with the times, love! But then I actually started reading it and I was HOOKED! It’s ace! It’s witty, and funny and SO handy! A million tips on everything to do with running a house, from making your own washing liquids to weekly budgets and shopping tips. Having done a little background research I’ve discovered it was quite trailblazing publication. 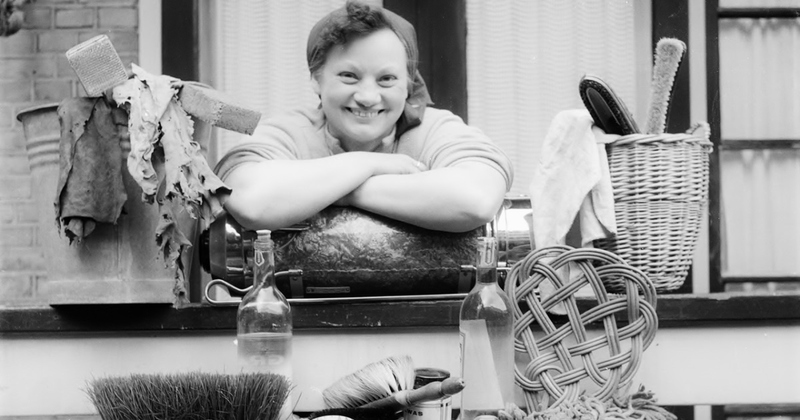 It was aimed at the emerging working woman who had little time to dedicate to cleaning her house. So. In 2016: How clean IS your house? What are your weekly routines? I need to see if our level of cleanliness meets acceptable standards. Comment, Facebook or Tweet me. I NEED TO KNOW, like NOW!!!!! No I would be totally excited by this too! Because then it's all clean and sparkly before Christmas armageddon! yey! Having cleaning issues this week as other half has broken the pipe on the hoover (for the second time) as he is a bit over enthusiastic. I hate hoovering but the carpets are looking pretty crap and had to borrow one from next door 😒. Wine first me thinks. Always get the wine in. Priorities! Oooo, no, no, no. Cupboard fronts need cleaning and I do clean around door frames. I once even went over the top of skirting boards with a tooth brush. Don't, however, let this fool you. We have a forntightly cleaner and I kinda muddle along inbetween her visits and have a panic and blitz the place before she arrives because the house gets into a disgusting state! I'm still reeling at vaccumming a mattress. And no, I have never dry cleaned curtains in my life!